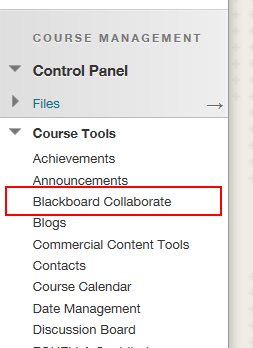 Browse to the course tool by clicking Blackboard Collaborate under Course Tools in the Control Panel.Note If you have added the course tool to the course menu you can also click that link. Click Create Session from the Schedule a Session box at the top of the page. Below is a screen shot of each section of the settings with an explanation of it’s function and a suggested value. The session name will always default to the name of the module. It is suggested that you change this to the name of the specific session you wish to run. Set the Start Time as the time you will begin your session – you set early session entry in the option below. The End Time is when you expect the session to finish. If you overrun, it doesn’t matter – the room won’t close at this time, only when everyone leaves it. Is the window of time before the scheduled start time that participants can enter the Collaborate session prior to it beginning. We suggest that you set this to at least 30 minutes, this gives you and your participants time to check audio before the session begins. Switching Repeat to ON reveals the menu below. Please take care using the repeat feature so as not to end up with lots of sessions scheduled that you do not actually require. 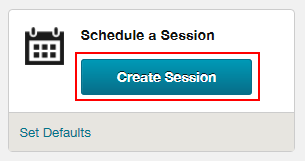 By default sessions are made accessible to members of the Blackboard Course that you are scheduling the session in. 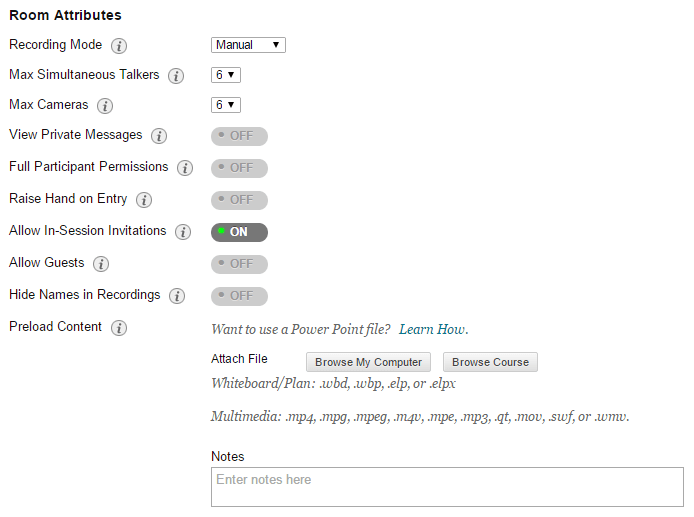 You can share sessions across other Blackboard courses where you are an instructor. When you select Shared the Additional Courses list becomes active. Clicking into this box shows you a list of your other courses. Select one or more from the list as required. You can remove a course by clicking the X next to the name. In practice very few sessions are ever shared across multiple modules. Although the built system works, it can be problematic as there is only a local number for North America. Of course users from all over the world could use this number but it is likely to be very expensive for them to do so. If you have subscribed to a separate teleconferencing service, tick the Third Party option and enter the relevant details when prompted. The Recording mode drop down menu has three choices. The recording starts and stops automatically. No recording can be made of the session. Refers to how many people can have an open microphone at the same time. If you are ever intending to “hand the floor” to any of your participants during a “normal teaching and learning” session, we would suggest having this set to 2. In a “meeting” type session we would suggest having it set to the same amount as the number of intended participants, up to the maximum of 6. This is very dependant on the type of session you wish to run though so proceed as appropriate. How many people can be broadcasting their web cam at the same time. If you are ever intending to “hand the floor” to any of your participants during a “normal teaching and learning” session, we would suggest having this set to 2. In a “meeting” type session we would suggest having it set to the same amount as the number of intended participants, up to the maximum of 6. As with max simultaneous talkers, this is very dependant on the type of session you wish to run. We suggest leaving this as per the default (OFF), to maintain a level of trust between the moderators and the participants. If this is set to ON, students are informed of this by a ‘Supervised’ heading appearing in the chat area. Unfortunately the controls are not particularly granular, so you can either allow participants to do everything or nothing. We suggest that if you are scheduling a large session leave this setting OFF as use of the tools (particularly the interactive white board) can get out of hand very quickly. If however you are arranging a session for a smaller group then switching it ON might be appropriate. What ever setting is chosen you can grant or remove access to any of the tools during the session as required. If switched on, as a participant enters the session the raise hand feature is activated. A number is placed in the “raise hand” column in the participant list to represent a queue of who raised their hand first. This can be useful with larger groups where you may have a moderator designated to greeting participants to make sure that they have everything set up in the required manner. Allows moderators to send an invite from within the Collaborate session to participants. These can be to participants that don’t have access to the required Blackboard module such as a guest speaker. Invite participants to the the session who do not have access to Aston’s Blackboard, or the Blackboard course. Please see the Generating a link for external participants tutorial for a full explanation of how this works. Allows moderators to anonymise recordings. You can preload content that is either automatically sent to participants when they join the live session or in the case of a “white board file” is loaded into the white board area. The file types are limited to those displayed in the list above. When switched ON, students will be automatically graded for attending a session. You can decide how many points they will be awarded. The column is created and the relevant points entered into the grade centre at the end of the session. Do not use this feature if you simply wish to record attendance. Please take a look at Viewing Session Attendance if this is your intention. By default every one who is enrolled on the Blackboard module will have access to the session as a Participant, with you, as the person scheduling the session, being given the moderator role. 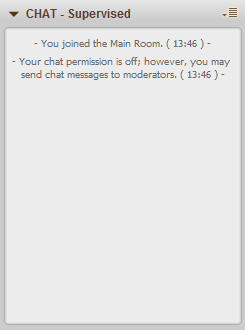 Other instructors on the module do not automatically get the moderator role. You can may add additional moderators by clicking Add Moderators and selecting users as appropriate. These can be staff or students enrolled on the Blackboard course. Ticking the Restrict access to this session box reveals the Add Participants button. If you intend just students from your module to attend leave this as is. This is only to be used if you wish to restrict to a number of individuals within those students.